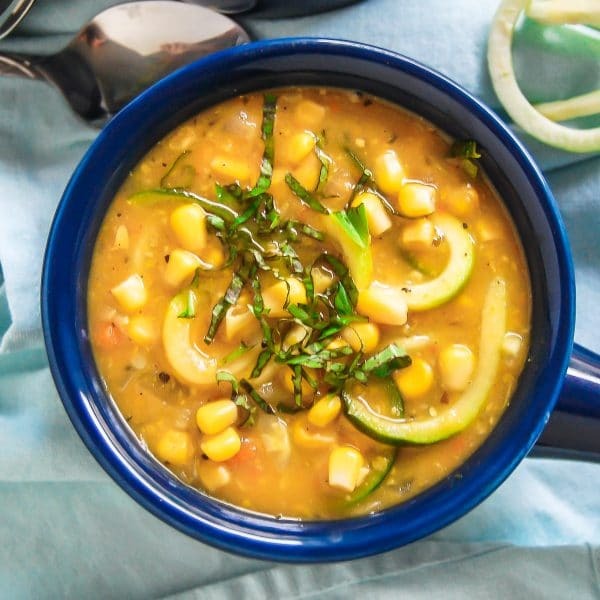 This zucchini noodle summer corn chowder is a bright, fresh, flavorful chowder perfect for any season! 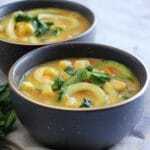 By posting this Zucchini Noodle Summer Corn Chowder recipe I am entering a recipe contest sponsored by Libby’s Fruits & Vegetables and am eligible to win prizes associated with the contest. I was not compensated for my time. 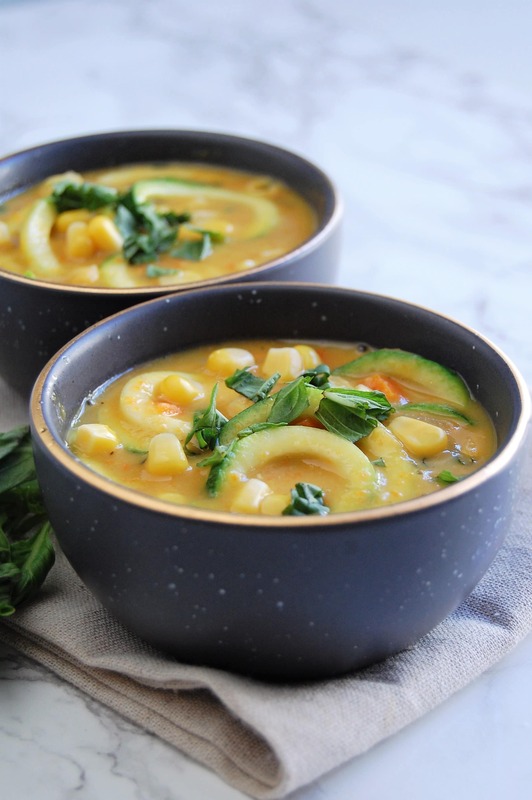 I am so excited to bring you guys this Zucchini Noodle Summer Corn Chowder today. One, because it is freaking delicious. Like, my eight month old loves it and yelled at us when we weren’t helping her shovel chowder fast enough! Two, because you guys know I’m passionate about finding nutrition to fit your life – including your budget, and canned foods can play a surprisingly nutritious role in helping your food budget! In fact, I previously wrote a whole post about benefits of canned goods! When The Recipe Redux shared this recipe contest sponsored by Libby’s Fruit & Vegetables challenging us to to create quick & easy unique recipes that show off the convenience and surprising on-trend culinary versatility and taste of Libby’s Fruits and Vegetable, I was all about it. This side dish comes together easily, has an amazing depth of flavor, and is definitely on-trend. How so? Because it uses both ground ginger and coconut milk, both listed in the most recent list of food trends put out by Google. Don’t have a spiralizer? Try thinly slicing zucchini or using a vegetable peeler to create ribbon-like “noodles”. Cornstarch not a fit for you? Try arrowroot starch in a 1:1 equal substitution. 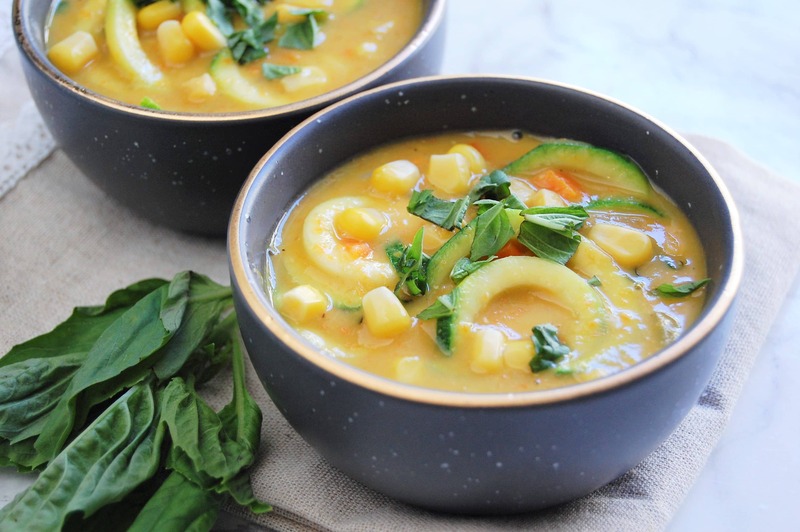 You guys HAVE to make this simple and crazy ridiculous Zucchini Noodle Summer Corn Chowder! It’s the perfect summertime side dish, especially for rainy evenings with thunderstorms – cozy, elegant, fresh, and simple! Need any other soup, stew, chili, or chowder recipes? Try these! If you give this recipe a try, be sure to comment and leave a rating below. And as always, share on social media (be sure to tag @nutritiontofit and #nutritiontofit!). Live and eat well! Heat 1/4 cup of the vegetable broth in a large stock pot over medium-high heat. Add garlic, carrots, and onion and saute in the broth for 4-5 minutes, or until onions are translucent and carrots are becoming tender. Stir in Libby's Whole Kernel Sweet Corn and ground ginger until combined. Remove 3 cups of the chowder and place in a blender. Add cornstarch to mixture in blender. Blend on low for 30 seconds, or until pureed smooth. Nutrition facts will vary based on exact ingredients used. I can never have too many zucchini recipes in the summer – this looks delish! Thanks Deanna! It’s a great way to use up all that summer zucchini! The basil was so good in this! Such a healthy and cozy chowder! Awesome, thanks Tawnie! I love the freshness and brightness the basil adds, too! Even in the summer soup is delicious and this was the best way to use up some of my zucchini I had in the fridge! I froze some of it to enjoy later on in the season too! Freezing leftovers is a great idea! Surprisingly enough I still have zucchinis in my garden so I decided to make this and it was soooo good! I’m so glad I did, thanks for sharing the recipe! I can’t believe you still have zucchini in your garden! Glad you liked it! Why did I wait so long to add zoodles to my soups?! Yum! Yum! I have no idea, they go great together! I discovered corn chowder from an aunt who’s from Maryland and was obsessed with how such a simple vegetable can make such a satisfying soup. Love how easy it is to make it a vegan option, as well. Great work!